Blogging while employed by a giant law firm is different than blogging when you have your own firm. I published often when I was with DLA Piper, so I had a good sense of what I could and couldn’t write about when I started this blog. But when you work for a firm that has a trillion employees and represents just about everyone, you have to be very careful that (1) you don’t write about a client; and (2) you don’t take a position that will prejudice a client. The former is easier than the latter. You just stay away from specific cases. With regard to taking positions, I typically wrote about issues where I knew we had already taken a position in a case or where I knew we would be unlikely to take the counter position (i.e. favoring a class-action plaintiff). That is not to say that big-firm employment biases one’s articles. But you have to select your topics wisely. When I started my own firm, I was told by many that I probably wouldn’t be able to do antitrust work anymore. 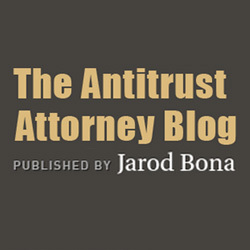 Well, thanks to this blog, I receive many calls about antitrust cases and matters. If you go to Google and type in “antitrust attorney,” you will see this blog in the first couple positions. That has been fortunate for my practice. Many people search for “loyalty discounts” and “resale price maintenance.” I’ve noticed through Google Analytics that many people research these terms. I suppose I should write more articles on those issues because people seem to have questions about them. It isn’t a big surprise because antitrust law relating to both loyalty discounts and resale price maintenance is somewhat confused and conflicting. Over time, I’ve learned that many readers are not antitrust experts, so I should make sure to explain complicated and jargon-filled antitrust concepts in ways that non-antitrust lawyers can understand. That isn’t always easy to do when you are deep into a profession of any sort. So it is a constant challenge. I’ve developed a compromise where I will write some articles at a more advanced antitrust level and others at a level that I think is easier to understand if you don’t spend hours each day obsessing over antitrust and competition law. I still need to add a blogroll of antitrust and other legal blogs. I’ve been meaning to do that for months. So if you have an antitrust blog, my bad. I’ll get it up here at some point. Speaking of other antitrust blogs, I do read them (and other legal blogs, including the legal academic blogs). I should interact with their content more than I do. That is an area where I can improve. Once a week is about the right schedule for my blogging. With actual work and other responsibilities, it is difficult to do more than one quality post each week. Fortunately, over the last year I have learned to write faster. That helps. I have also learned that I write best in the evening. Before this post deteriorates to the point where I am telling you my favorite foods, I better end it here. But thank you for reading. I am very appreciative of every person that stops by to read my ramblings. If you want to receive these posts by email, you can subscribe by putting your email address in the box on the right.